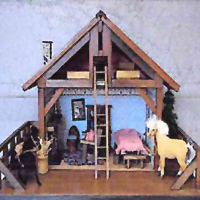 This unique dollhouse is from the private collection of the nationally known miniaturist Carole and Neal Pruzan. First Prize: The Dollhouse pictured here. Second Prize: A $15 Museum Gift Shop Certificate to be used for dollhouse furniture and/or accessories. Third Prize: A copy of The Dollhouse Book, by Little Tiny Visions. Sponsored by the FRIENDS OF THE YORKTOWN MUSEUM as a funraiser for the Museum Programs. This page was last updated on December 12, 2013.